Coming soon to a theatre near you, the films you know & love by Wong Kar Wai.....now in SepiaVision! This is great news. Hope they delve into more of Bunuel's 1950s films. One potential release I'd been expecting to happen from somebody for the last 2-3 years is a revisiting of Jonathan Glazer's Birth. I'd have thought with the acclaim Under the Skin got that we'd seen an effort to go back to the relatively overlooked previous film that's still only on DVD as far as I'm aware. Not a bad DVD at all but still its surely a film that would have some market? I know I'd order a well done Blu-Ray in an instant. One of my most wanted Criterion (or at least Blu-Ray) titles. I'm still waiting for the Freaks (1932) release. Criterion has a good relationship with Warner, right? What's the holdup? Any films like this my guess is it has to be the elements are not up to snuff. Have Warner debuted themselves or licensed any films from before the 1940s on Blu-ray in 2016–2018, aside from Bringing Up Baby? The elements to films from that entire era can't all be that bad, so my guess is some irrational corporate decision at work. Criterion licensing Bringing Up Baby stands out as a lone exception to this. Good point, although didn't Island of Lost Souls have subpar A/V quality? Maybe there's some hope for better prints of Freaks, unlike the former? I knew there was a reason I haven't bought the Eureka release! The last time TCM showed Freaks, it was in true HD and looked very good. Criterion licensing Bringing Up Baby stands out as a lone exception to this. Is that officially confirmed? I know it's been heavily speculated but I didn't know if we really knew for sure it was coming or not. I'd certainly be thrilled. I love screwball comedies and it's my favorite of them all. My phrasing surely reflected wishful thinking, as I adore Bringing Up Baby. I guess it's about as certain as the fact that upgrades of both Written on the Wind and The Lady Eve will be announced this month. Last edited by Gregory on Wed Sep 05, 2018 6:38 pm, edited 1 time in total. I'm often an idiot when it comes to details (like Dunne looking nothing like Hepburn even from the side/back). Why do I even post here anymore? In my defense (?) I was very hastily searching for evidence on the forum about the Bringing Up Baby rumors and found my way back to the New Years drawing. So what was the reason it was getting so many guesses in the quarantined thread? Anything remotely solid? 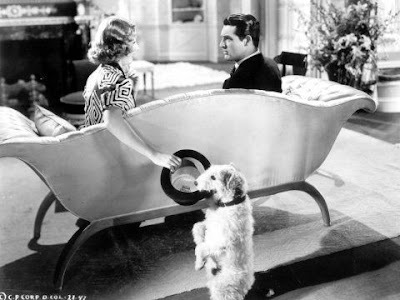 Bringing Up Baby seems to be OOP from Warner but who knows what that means. My apologies, for I'm mostly the guilty party! The issue here was that besides that Filmstruck nonsense, everything in the New Years Clue was for unannounced titles, and they hadn't included any already-announced films for many years. While Dead Man hadn't been listed on the website yet, Criterion sent out an email saying it was coming + we had the newsletter clue! So that left us with a question over the Skeleton - where the obvious answer would be Dead Man. If the skeleton wasn't for Dead Man (given the "already released" precedent) - then it would be for something else. Since the dog overlapped the skeleton, then it stood to reason they were connected somehow. Thus, we looked for movies that would make sense + had that same dog in it. That gave us best-guess answers of The Thin Man or Bringing Up Baby (Mr Bone). To add to the conspiracy, Bringing Up Baby was one of those WB DVDs that went OOP along with a bunch of other "obvious" Criterion WB picks. But of course, it could just be like others (mostly Domino) thought: just a clue for Dead Man. I will give Criterion the rest of 2018 to release Bringing Up Baby before relenting (I'll remove it when the next New Years clue comes out). Granted, we're still waiting on 16 Candles or 4Months 3Weeks and 2Days from previous New Years clues (and don't get me started on that Possum / Rat). But, we've had some dueling newsletter clues this year, so the final answer won't be until its released somewhere. I'd strongly bet on it coming, clue or not, but I'll remove it if we don't get it in December. If Ribs needs a new avatar, then here you go. Winchester ‘73 and The Naked Spur would be excellent. The naked spur looked fairly rough on FilmStruck, it probably needs a new harvest and grading in addition to digital clean up. Could be a while. are we still waiting for West Side Story? 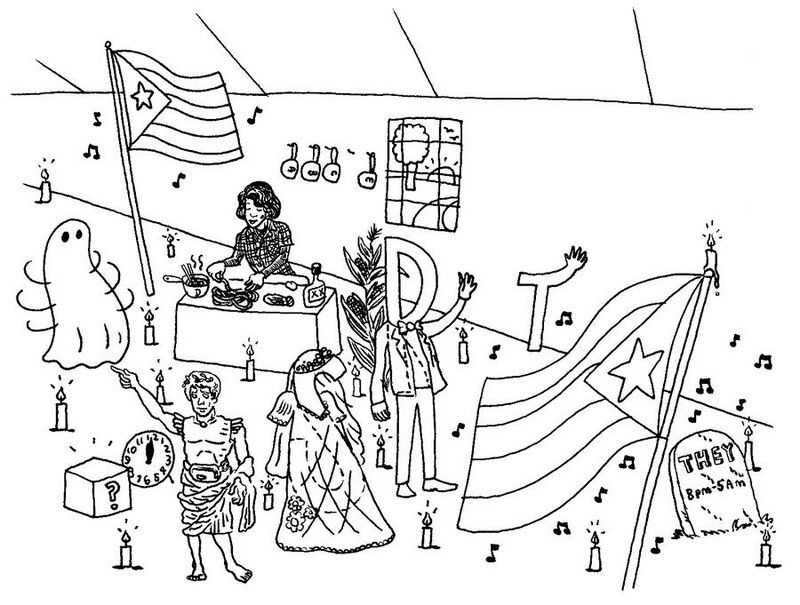 I don't believe those 2 flags were both for Buena Vista Social Club..
but it's not a musical. those 2 flags have musical notes around them..
Has anyone pointed out the fact that one flag has six stripes while the other has five stripes? I still suspect that clue is for West Side Story. Shortly after, we had a phantom page which clearly pointed to this movie - which hasn't been resolved yet. Its also MIA in terms of a re-release from any company / studio, and Criterion has been going after a lot of Best Pic winners lately. I think I said before that the 6-stripe flag was probably Polan's joke at the fake Puerto-Rican culture on display in the movie. We're also missing 16 Candles from that image - which was confirmed by Criterion with a telecine picture or something from Instagram. Sometimes these things take several years (ala Y tu Mama Tambien). Its possible (but don't make my speculation into a Twitter trending topic) that the #MeToo movement has forced their hand to either delay or abandon the release. I'm sure the character Long Duk Dong didn't exactly help matters either. I believe someone mentioned Criterion might also have had plans for The Usual Suspects - and I'm sure (if true) that was another project that had a fallout because of the current climate + the actions of Spacey / Singer. I'm sure there's probably several others films that Criterion is fairly hesitant about promoting right now (like anything from Polanski). This is of course just speculation, and I think Criterion has already gone out of their way to address potential issues in certain films - as with the extra on Shanghai Express and Othello. I'd expect them to do the same if / when they finally get to some of these more controversial films - but releasing certain films right now would likely result in a large backlash. Sometimes things get delayed, sometimes for many years, but I'll leave them up until they turn up at Criterion or elsewhere -as its not doing too much harm.